Up for review today is the Powstanie Broadleaf Perfecto, a cigar that hails from the RoMa Craft factory. 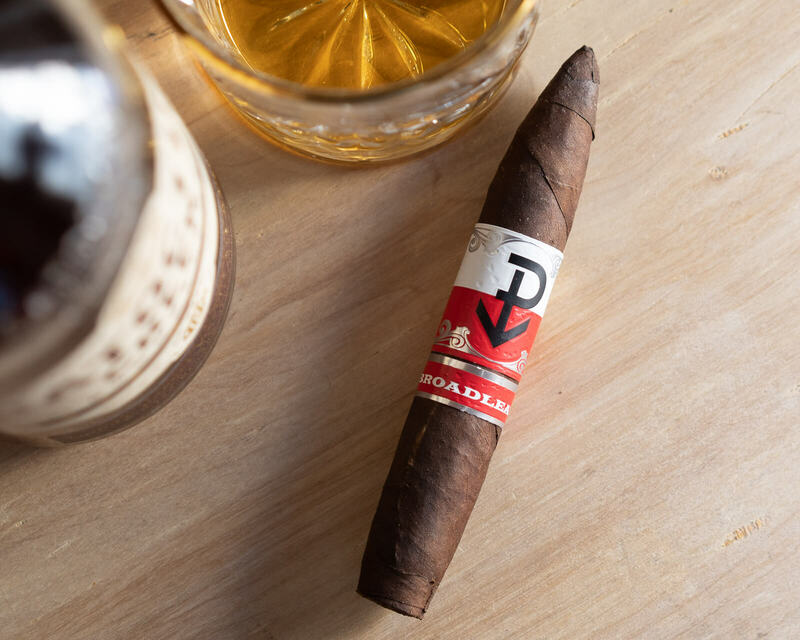 The cigar is called Powstanie—poh-shan-yah—which is the Polish word for “uprising.” That theme extends over to the logo which was inspired by symbols used by the Polish resistance movement in World War II. As for the blends, there are actually two. Mike Szczepankewicz told halfwheel that the brothers each created their own blends with the help of NicaSueño’s Esteban Disla and Skip Martin. They then let customers try the blends blind and give feedback as to which one they would like to have as a new line. That out of the way, let’s get to the review. 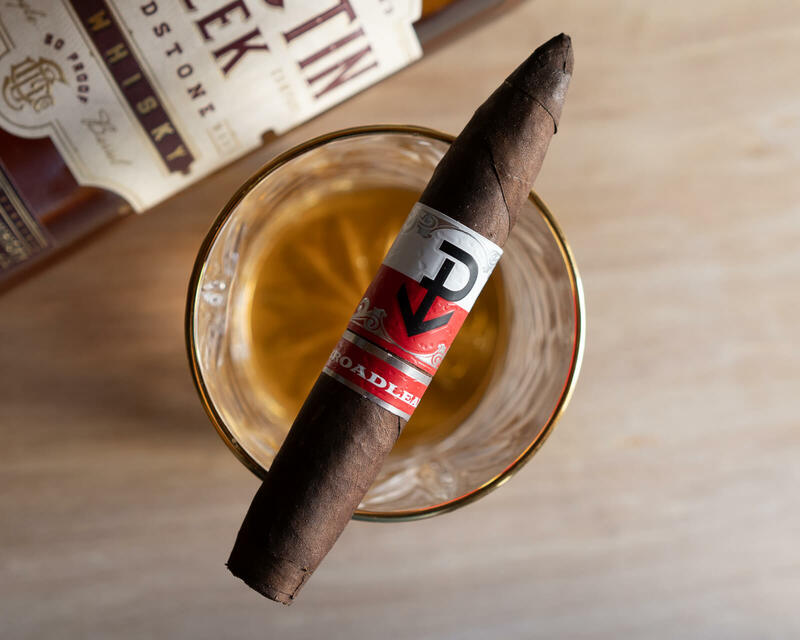 The Powstanie Broadleaf Perfecto comes with an interesting band: it’s modern, two-toned, and very eye catching. Shout out to the designers behind this label. The broadleaf wrapper is something to behold as well (I tried to catch as much detail as possible in the photos). The wrapper is quite rough and rugged, with a lot of texture and a very dark color. When squeezed, the cigar reveals itself to be packed tightly with very little give. After cutting the cigar with the straight cut, I test the draw. It’s perfect, about a 7/10 in terms of amount of restrictiveness. The cold draw isn’t something to write home about. Just some pepper and cocoa notes. Off the foot of the cigar, I can smell dark chocolate chunks, cedar, and a little bit of pepper. The Powstanie Broadleaf opens with strong, highly concentrated smoke. Flavors include charred wood, grass, cocoa, earth, and pepper, and the retrohale features a very fine black pepper that’s strong but not totally overwhelming. Overall, it’s a dark, fairly straightforward profile that leans on the spicy/bitter end of the spectrum. On the construction side, smoke production is good, and it falls above medium but below full body. At an inch in, the ash is holding strong and the burn is straight. Unfortunately, the flavor hasn’t developed so nicely. Instead, it’s reduced down almost entirely to black pepper, earth, some salt and mild cocoa powder. By halfway, there’s been little change to the profile, and the cigar overall is lacking complexity. Strength and body are both at full here. The final third of the Powstanie Broadleaf Perfecto develops a bit with the addition of a generic sweet note, but it’s too little too late. The smoke heats up dramatically, making it necessary to end the smoke early. The Powstanie Broadleaf Perfecto has a lot of potential, but it’s ultimately an underperforming cigar. It scores high marks on construction, but that’s about it. I spent most of the hour long smoke hoping that it would develop some nuance to the flavors, and it never did. I can’t recommend this cigar, but I am going to hunt down some of the other blends and try those.